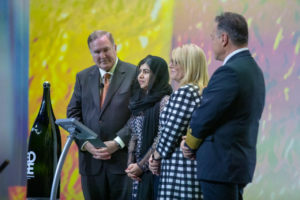 The naming event brought together more than 3,000 guests, employees, crew members, and students to commemorate the debut of Celebrity’s first new ship in six years and first new ship series in more than a decade. Yousafzai, who is now a college student at Oxford University, is the co-founder of Malala Fund, which advocates for a world where every girl can learn and lead by investing in local education activists, holding global leaders accountable, and amplifying girls’ voices around the world. She discussed those issues before the ship’s crew and guests in a one-on-one interview with Celebrity’s President and CEO, Lisa Lutoff-Perlo. From girls’ education to the power of diversity, both share a passion and commitment to these issues. At the naming event, hosted by designer Nate Berkus, emotions ran high when acclaimed recording artist Andra Day took to the stage for empowering renditions of her singles “Rise Up” and “Stand Up For Something.” Both anthems were chosen for their statements about the power of girls’ education and its role in shaping the future. The brand chose to forego the traditional champagne bottle at the launch, and instead smashed a custom-made 18-liter bottle of Badoit French mineral water across the ship’s Parabolic Ultra Bow. And with that, the ship’s long-awaited inaugural season will get underway.